Today sees the launch of a large-scale home computing experiment called "weatherathome" , modelled on similar uses of background computing such as SETI@Home (using idle PC processing power to search for evidence of extraterrestrial life). The site behind it is Climateprediction.net, which is one of the world's most important websites dealing with the effect we are having on the atmosphere we need to sustain us, and every other living thing on the planet. Climate change, and humanity's response to it, are issues of global importance, affecting food production, water resources, ecosystems, energy demand, insurance costs and much else. Current research suggests that the Earth will probably warm over the coming century; Climateprediction.net should, for the first time, tell us what is most likely to happen. 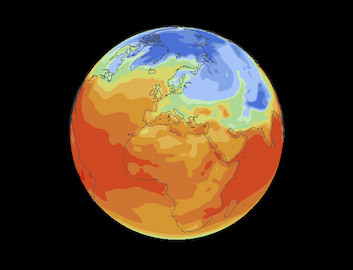 The Met Office, in partnership with Microsoft Research have developed a regional climate model which can be downloaded to PCs at home and run in the background, providing information about how the climate is changing regionally. If enough people join up, this will be the largest climate experiment in the world, and give scientists a massive amount of data to analyse which will keep them working for years. All you have to do is simply download the software and report on weather in your area. Initially this will cover the Western USA, Europe, and Southern Africa, because this is where there are plenty of home computers. Southern Africa, in addition, is thought to be particularly vulnerable to climate change. 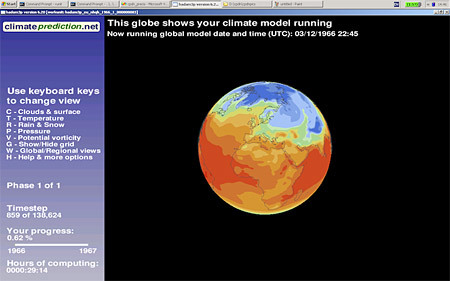 As the model runs in the background, without interfering with the normal use of the computer, it will feed back the results to climate prediction .net via the internet. You will be able to see your own unique version of the world's climate as it is modelled on your computer. 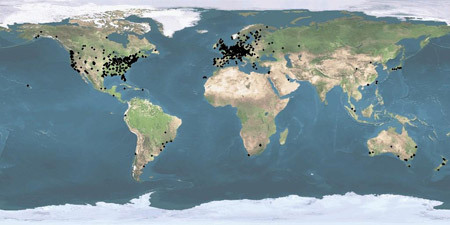 Climateprediction.net uses the same underlying software, BOINC, as many other distributed computing projects and you can participate in more than one project at a time. Getting involved in the project is very easy. All you need to do is download and install BOINC, then attach to the Climateprediction.net project — you can select the project from a list of all available projects when you run the software. Download BOINC from the BOINC home page.